HeyPlantMan! Exotic Tropical Plants from St. Pete FL: Tropiflora and Market happenings ! Tropiflora and Market happenings ! Wow, what a great weekend! We are exhausted but exhilarated from a busy show weekend. 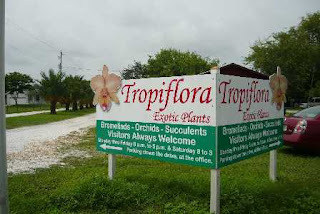 First, we had a great time at the Tropiflora Nursery in Sarasota, FL. If you ever have a chance, this place is a MUST for Bromeliad, Succulents and Rare plant enthusiasts! Dennis & Linda Cathcart were wonderful hosts to all of us vendors as well as the thousands that showed up for the 3 day Fall sale. Fri & Sat were are busiest days and our little Butterfly Wing just went sailing out of the booth faster than we could stock! We can't wait to back in the Spring. Thank you Dennis and Linda and all your wonderful family and staff that were such gracious hosts to us and always makes us feel like part of the family ! And, many thanks to the many customers that came from far and wide ! Opening day at the St. Pete downtown Market had a great turnout. We know it is a challenge for regular market customers on the first day due to the Walk-a-thon, so thanks to the many that braved the crowds and parking challenges to show up! Our new spot on the "Growers" row was successful and we look forward to improving our set up as the weeks and months progress. The Pepperfest! at Sunken Gardens was fun, but we think do to the heat, the turn-out was way down. A very hard set-up and the heat made for a long day but we had fun meeting old and new friends. Thank you to the administration and staff for letting us be a part of it. Coming up? Saturday Market Days continue as well as some away shows. Many have asked if we are participating in the USF Fall show, but it is not on our schedule. All for now, looks like another warm week, so keep your cool !